Don't Anthropomorphize Mechanical Devices. They Hate That! I don't normally do that, not just because I know they hate it, but because I'm sufficiently emotionally attached to my gadgets and toys that it's superfluous. I did slip once, naming a particularly cranky adding machine* "Klendathu" after the Bug Planet. But I've never named my cars, as many people do, so "Mr. Prius" will have to do for this blog. Why am I thanking him? Although it was a slightly rainy morning. Traffic was light, and the (almost literally) milestone captured above passed without remark by Mr. Prius, almost as if he weren't anticipating the event as much as I. Not that I was anticipating it to any great degree. I just happened to notice that it was getting really close and had my cellphone camera in my hand for the not-so-big moment. Since this web site (if not the blog) is largely dedicated to the Prius in general and this exemplar in particular, I thought I'd issue a brief report on how it has fared since I bought it at the beginning of 2005 and update the FAQ that I wrote back then. Asked the dealer to look at the shift lever. It was (and is) making a clicking sound. Unanticipated repairs of any sort. I find this reliability remarkable. Contrast this with the blue Audi which sustained many kilobucks of repairs before it hit the 100,000 mile mark and which I deemed unsafe to drive thereafter. In the six years I've owned the Prius (and despite my calling it the ugly Prius because of its nasty color) the car hasn't stranded me once or ever refused to start. It's been by far the most trouble-free vehicle I've ever owned. I promised a brief report, so I'll summarize by repeating the title: Thank you, Mr. Prius. *When I wrote "particularly cranky" I meant it in the colloquial sense. But this was so long ago that the adding machine was literally cranky. It operated by using a crank to move the mechanical components that produced the result. The same office had a copying machine that used thermal paper. 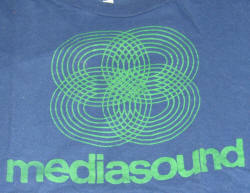 A T-shirt from the heyday of Mediasound, one of the storied studios of New York City.